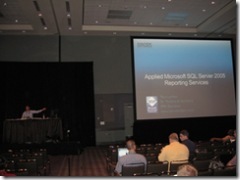 I just attended the session named “Applied Microsoft SQL Server 2005 Reporting Services” held by of Teo Lachev . Teo developed a complex solution that allow an end user to build its own reports with financial data, using Reporting Services as a back-end engine but defining its own custom report designer. While someone may object that there is not so much flexibility in report definition with this solution (you have several constraint in report designer), it could be appreciated by the many existing users that only want to say what data want to see into a report, while they didn’t care much about possible layout customization. In reality the report looks very good for that kind of users. The interesting part is that Teo developed an object model to abstract the underlying RDL that simpliefies an application that needs to deal with such a format. That model persist RDL through XML serialization and (as Teo hope) it would be useful if Microsoft would publish an “official” object model upon RDL. Teo also showed other techniques he used in his solution, like retrieving data using CLR stored procedures, subclassing Report Viewer control to implement best practices and rules and finally how to extend reports with custom code (i.e. to use particular formats for numeric values based on locale of the user executing the report instead than a fixed format defined for the report – not a usual case, but if you need it… it’s useful to centralize all that logic in a single assembly). It’s interesting to see a completely different approach like this using Reporting Services 2005.